After careful consideration of the options, the FEGA BOD decided to do a Colt Single Action Army Revolver for our 2017 Auction Gun. Three FEGA Master Engravers who are also Colt Master Engravers stepped up to donate their time and expertise in the making of this fantastic show gun. The Engravers are Mike Dubber, Barry Lee Hands, and Weldon Lister. Mike Dubber located a mechanically perfect 3rd Generation Colt for the Guild to purchase. Since Mike had done two jobs as project manager/engraver of the 2016 show gun, Barry asked me to be the project manager for 2017 and I accepted. Let’s say the logistics are complicated. The Colt came to me from Mike for disassembling and polishing and I stripped, restored and prepped the parts for engraving. The frame was sent back to Mike Dubber for his world renowned goldwork, including gold borders, the Sam Colt Signature on the backstrap and the Colt Dome on the loading gate. The barrel went to Barry Lee Hands for gold work which included gold lettering, borders and the layout of his exquisite 3 segment leaf design in 24k gold. 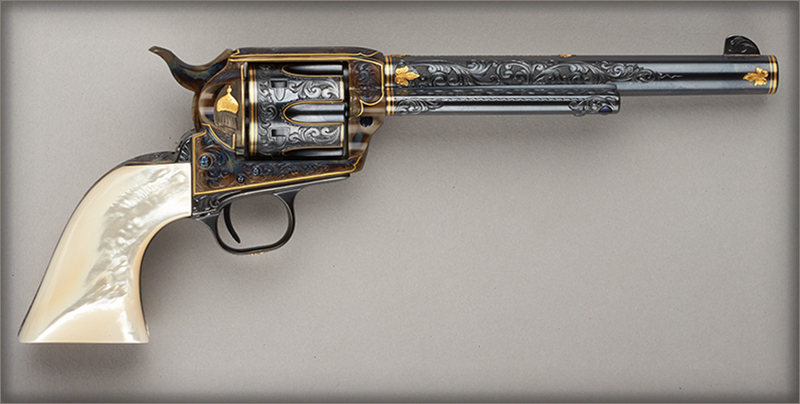 Parts were sent to Weldon Lister for his signature colt style- scroll work. Barry had already laid out where his leaves would go, and Weldon did an excellent job of putting his trade mark scroll under and around the leaf locations, as if he had designed it from start to finish all by himself. After Weldon was finished the parts went back to Barry who applied his stunning gold work in the spaces left for him by Weldon. Then the Colt was sent to Doug Turnbull for case colors and blue, who kindly and generously donated his labor for this project. When finished with his work, Doug sent the parts back to me for assembly. 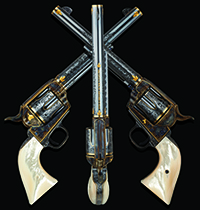 This is a exquisite show gun that anyone would be proud to own! The Colt really shows the talent of FEGA engravers, and at the end of the project Weldon’s special expertise at the Master level in the scroll design stage having followed Mike and Barry’s gold layout really shows through as the piece appears to be fully integrated start to finish. Please acknowledge your thanks to these Engravers in an email or the next time you see them for their devotion to the Guild. This magnificent piece will be auctioned at the FEGA banquet Saturday night January 21st at the FEGA Gun Engravers Show annual banquet and auction which begins at 6 pm. Tickets are available from Betty for $68 in advance or at the FEGA table, or call (406) 249-4334.